SAN DIEGO--(BUSINESS WIRE)--Intelligent Blends, a leading single-serve coffee and beverage company, has launched a year-long “coffee with a cause” campaign with the introduction of #PinkPods, a new variety in the Maud’s Coffee & Tea’s line, in partnership with the Breast Cancer Research Foundation (BCRF). 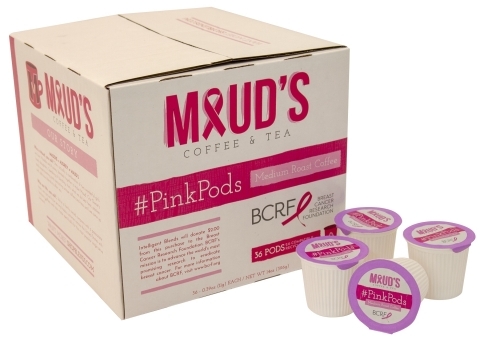 The first “coffee for a cause” initiative in the coffee pods category, in which the product was created specifically for BCRF fundraising, Intelligent Blends will make a $2 donation for every 36-count box of Maud’s #PinkPods sold. Maud’s #PinkPods feature a specially-designed alternate logo and BCRF branding on the lid of each pod and contain 11 grams of the brand’s popular house blend “Maud’s In the House Blend,” a well-balanced, medium bodied coffee with South American richness, made from premium 100% Arabica coffee beans. The Breast Cancer Research Foundation (BCRF) is dedicated to being the end of breast cancer by advancing the world's most promising research. Founded by Evelyn H. Lauder in 1993, BCRF-funded investigators have been deeply involved in every major breakthrough in breast cancer prevention, diagnosis, treatment and survivorship. BCRF is the largest private funder of breast cancer research worldwide and the highest rated breast cancer organization in the U.S. Visit bcrf.org to learn more.